Blue Guide India: By Sam Miller, Blue Guides (represented in India by Penguin Books India), 888 pages, ₹ 899. Writer and former BBC India correspondent Sam Miller traversed India for three years to put together the Blue Guide India. For Lounge, Miller picks five easy day trips from India’s great cities—places where you won’t be harassed by touts and are unlikely, for now at least, to meet other tourists. Just north of Mumbai and easily accessible by rail (Vasai Road is the nearest station) or road are the ruins of the Portuguese sea fort and city of Vasai. 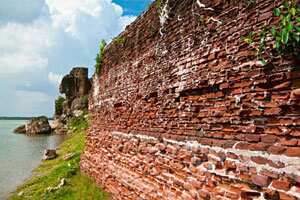 It was previously known as Bassein and has some impressive fortifications and no less than five beautiful ruined churches. Vasai was ceded to the Portuguese by the sultan of Gujarat in 1535, and stonework from older Islamic buildings was reused by the Portuguese. For two centuries, Vasai Fort was a place of fabled prosperity, inside which only the Portuguese aristocracy were allowed to live. But Vasai was relinquished by the Portuguese in the 18th century, and was forgotten. 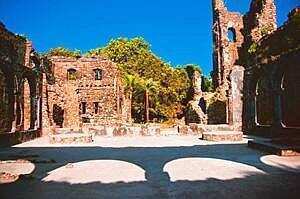 It is now a place of many ruins, strangely under-visited given their proximity to Mumbai. The most important of the churches, dedicated to St Gonsalo Garcia, is just behind St Paul’s and has recently been restored for Vasai’s large Catholic population. Garcia, the first Indian Catholic saint, was born in 1556 in Bassein to a Portuguese father and an Indian mother. He was one of the 26 “Nagasaki martyrs", Franciscan missionaries who were crucified in 1597 in Japan when they refused to renounce Christianity. The façade is in excellent condition, with Corinthian double columns on either side of the entrance arch, and an ornate rectangular window above. Notice the IHS monogram of Christ (the first three letters of Jesus’ name in Greek, transliterated into the Roman script), with accompanying cross and nails—on either side of the rectangular window. 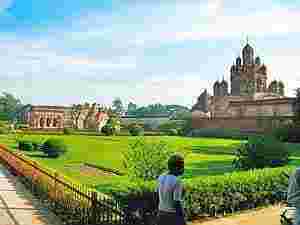 This town overlooking the Hooghly, 70km north of Kolkata, has several temples grouped inside the old palace compound, or Rajbari, formerly belonging to the princely state of Burdwan. Once in Kalna, ask for the Rajbari, and you will be brought to a road that separates the main group of temples on the left, and the unusual circular Shiva Temple complex on the right. 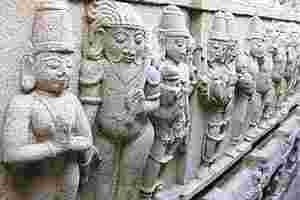 Then head into the Rajbari compound to visit the main group of temples. The first, a small Pratapeswar Temple (1849), has some of the finest terracotta decoration to be found anywhere in India. The modelling of the figures—humans, gods and animals, mainly in scenes from the Ramayan—are in excellent condition. Much-derided Haryana is full of undiscovered gems, and my favourite is Narnaul, just 130km south-west of Delhi. Among the fascinating buildings in this town are a water palace, a superb 16th century tomb, and an unusual example of 17th century Mughal domestic architecture. Close to the Rajasthan border, Narnaul was once a major administrative centre under the Mughals, and Akbar established a mint there. 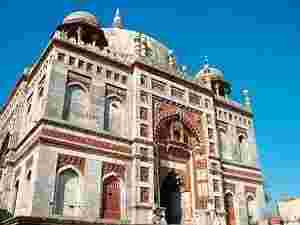 The mausoleum of Ibrahim Khan Suri, which is in the heart of Narnaul, is—in my opinion—one of India’s finest tombs. Ibrahim Khan was the grandfather of Sher Shah Suri, who defeated the Mughal emperor Humayun, and whose brief dynasty ruled in Delhi for 15 years. Sher Shah was born in, or near, Narnaul—and the tomb over his grandfather’s grave, built circa 1540, is in excellent condition. Note the high plinth, white dome, the octagonal chattris on the four corners of the roof, and the mix of colours, mainly grey and red, that makes the tomb so impressive from a distance. Go close to see the remarkable carved stonework; in particular the corbelling over the main doorway, which prefigures some of the fine sandstone carving on the Jahangiri Mahal in Agra Fort. Some 750m to the north-east of Ibrahim Khan’s tomb, in the backstreets, is another fascinating building. Known as Birbal ka Chatta, this five-storey residential complex was actually built after the death of Birbal, Akbar’s best-known adviser. It now seems that this crumbling edifice was constructed in the 17th century for the local chief, Rai Mukand Das. It contains an elaborate arrangement of underground rooms, lit through a complex series of skylights.